Will virtual reality ever really come to have a significant impact on real life? And aside from daily living applications, are there ways in which VR can be utilized for business? Could a construction manager or superintendent one day be checking up on site work by stepping onto the old holodeck? 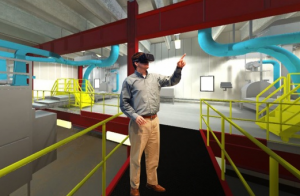 While a construction project manager might not have adventures in VR that are as dramatic as a Star Trek episode, the reality is that virtual reality as a construction technology tool is not a new concept. Ideas for the technology now known as Building Information Modeling (BIM) were being discussed as early as the 1970s, and the first BIM software debuted in 1987, in the form of a program called ArchiCAD. The advantages of BIM in construction over traditional 2-D blueprints or even 3-D structural models quickly became apparent. By "building" a 3-D structure on screen, architects, construction managers, and even clients could move through its rooms. This not only allowed various parties to envision the shape of an evolving project, but easily make additions or eliminations to it. Previously, such alterations would entail completely new renderings of plans, which was not only costly, but time consuming. But while it sounds as though as a construction technology tool BIM couldn't possibly have a down side, the construction industry has been slow to embrace it. Because of the technical know-how required to create and set up BIM programs, for a number of years the only construction manager or superintendent that could utilize it was one working at a firm with a robust IT department. But that has changed over the last decade. More and more digital technology leaders such as Microsoft and Daqri, are working on developing both VR software packages and accompanying accessories that are both affordable and easily adaptable for BIM purposes. And this emerging VR "democratization" doesn't just mean easier structure layout planning in 3-D. Today's BIM software allows users to work with digital models in both 4-D and 5-D as well. 4-D use with a BIM model means that a project manager can program the project work schedule directly into it, while 5-D allows project costs to be directly added as well. The result is a digital total package that saves both time and money by allowing for inclusion of and quick changes to project components. Larger construction firms such as McCarthy Building Companies in Arizona are already using current BIM virtual reality in construction extensively. While some firms are wary about using a technology that was developed for the computer gaming industry, given all of the time, money, and potential conflict that VR can save, this may be a game that they can't afford not to play.